As I drive through the West Side here in Kansas City, which has a large Hispanic community, it is not uncommon to see the image of Our Lady of Guadalupe everywhere--from the sides of buildings to the backs of pick-up trucks. What is this image all about?? Why is it important? 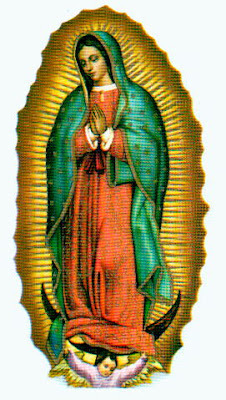 I figure that since we are celebrating the feast day of Our Lady of Guadalupe. On December 9, 1531, a man by the name of Juan Diego was walking to mass when the Virgin Mary appeared to him. She asked Juan Diego to go to the bishop and ask that a church be built in her name. Juan Diego did go to the bishop and tell of his vision but the bishop was skeptical and told Juan Diego to return another day. That evening, Our Blessed Mother again appeared to Juan Diego and encouraged him to return the next day. He did so an again was rejected. The bishop asked Juan Diego to ask her for a sign. On December 12th, Juan Diego's uncle became ill and he was in a rush to attend to his uncle so he avoided the spot where he first saw the apparition. It didn't matter--Our Lady appeared to him again. She asked Juan about her request for a church and Juan Diego spoke of his sick uncle. She told him that she had already attended to his uncle. As for the sign, she told Juan Diego to go to a nearby hill and pick several roses. It was not the season for roses but Juan Diego found several in full bloom. He filled his cloak with them and ran to the bishop's residence. Juan Diego opened his cloak to show Bishop Zumarraga the roses. A dozen red roses fell out and imprinted on Juan Diego's cloak was Mary's image. Bishop Zumarraga built the church and dedicated it to Our Lady of Guadalupe and it's written that within ten years some 9 million Aztecs became Christians. We celebrate the feast day of Our Lady of Guadalupe this second week of Advent, which is our preparation time for Christmas. Advent is the time of year that we not only prepare for the coming of Christ but show hope in times of desolation or despair. In this time of winter, when the trees around us have lost our leaves and everything is brown. Evening comes to us early in the evening and stays with us later in the morning. Certainly, there are no roses blooming. But Our Lady showed Juan Diego roses in bloom on this day and left her image--left it on a cheap cloth made from cactus fibers that should have deteriorated within several years. This isn't a time of despair. It's a time of hope, a time of excitement of preparation for the coming of our savior. We need to take time out of this busy season and stop preparing for Christmas morning or Christmas day. This season isn't about shopping, or parties, or baking. It's a time when we need to step back and spiritually prepare ourselves for the coming of Christ. Maybe our prayer life has become stale. Maybe it's become non-existent and we need to rededicate ourselves. Maybe we need to bring our family together nightly to the family dinner table, surrounding the Advent wreath--light the appropriate candles, pray, and share our faith with our children. Yes, in this season of Advent, Our Lady of Guadalupe shows us hope. From the death of winter, she shows us life and helps lead us to her son, Jesus Christ. Let us be reminded to take the time to prepare ourselves and our family spiritually for the coming of Jesus. I enjoyed reading your post. Thank you for the encouragement and the reminder to always focus on the reason for the season. I'm no longer entangled in the "rat race" and live a rather solitary life and find it easy to not be distracted from my prayers, but I know there are a lot of busy folks with families out there, getting lost in the menial tasks of life and forgetting the big pictures. There was another interesting fact about the roses Juan Diego took to the Bishop. They were Castillian Roses, not known to exist in Mexico but endemic to Spain, a fact not lost on the Bishop, a native of Spain! !